This post is brought to you by Kizmos. 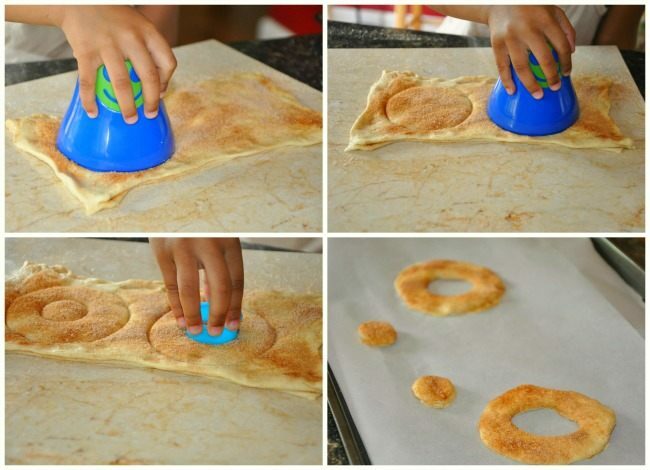 Do your kids like to help you in the kitchen? I use the word *help* very loosely! In any case, they will love using these wonderful Kizmos kitchen tools featured in today’s post- An easy recipe to make churros and doughnuts . Pre-heat the oven to 350. Line a baking sheet with parchment paper and keep ready. Measure and mix the cinnamon and sugar to create the cinnamon-sugar mixture. 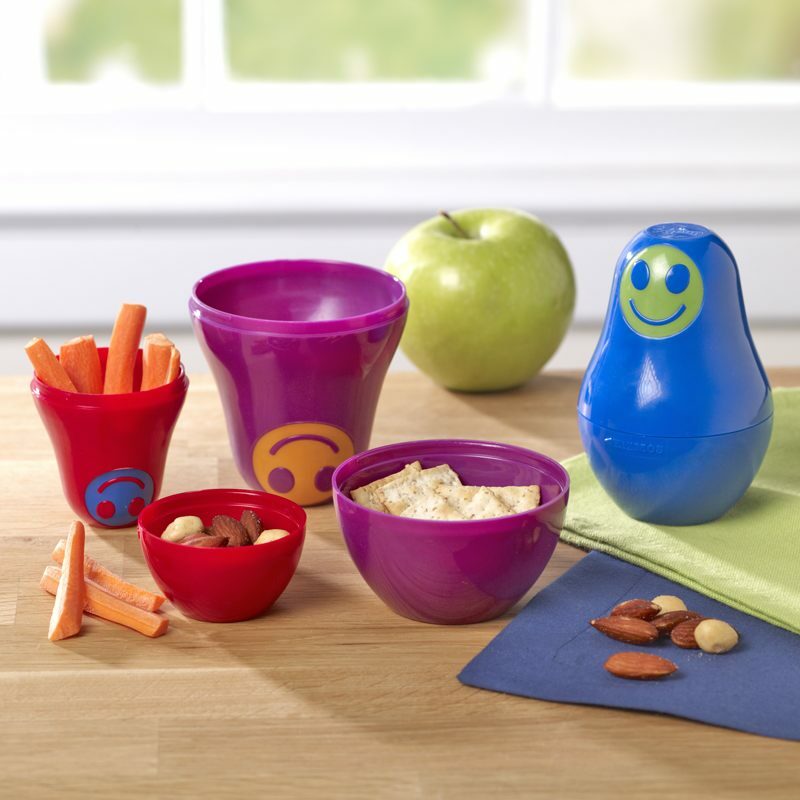 We used the cheery and bright measuring spoons from Kizmos’ “Get Happy” Collection. The tools did justice to their name- they were colorful and my preschooler enjoyed using the “happy spoons”. The joy of cooking increases with gadgets that make cooking look seamless and so much fun. Kizmos does just that. There is countless research that recommends to let kids assist you in the kitchen so they are comfortable with the ingredients and so take the pressure off in trying something new . For my picky eater to try any food without rejecting it instantly, is a huge effort. Working with Kizmos has broadened the scope for her to try to get more hands on with me in the kitchen which has helped her open herself up to trying foods just because she’s played a big role in creating the dish. 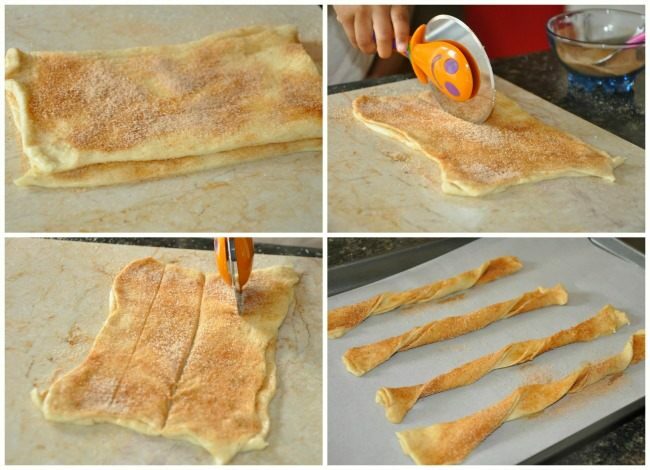 Next step in this simple recipe, unroll the dough sheet and cut it into 4 rectangles. We used Kizmos Pizza Cutter for this.. They are gentle than a sharp knife and a tool like kizmos cutter erases the fear of using a regular serrated knife. Brush the melted butter on the 4 rectangles and sprinkle evenly with cinnamon – sugar mixture. We used other 2 rectangles to make a pile one on top of the other and we used the Kizmos Nesting Cups ( the largest 1 cup measure) to create doughnut circles. We used a small round cookie cutter to create the doughnut hole. A quick note: Kizmos Nesting Cups come in a set of 3 and each part ( in total 6) is a measuring cup of a different size. 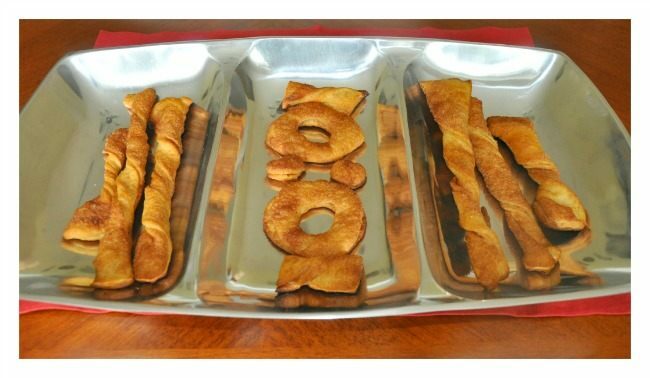 We laid the churros and the dough nuts on a baking tray and baked at 350 degrees for 9 – 11 minutes. Time to enjoy the treats made with these fun little tools. 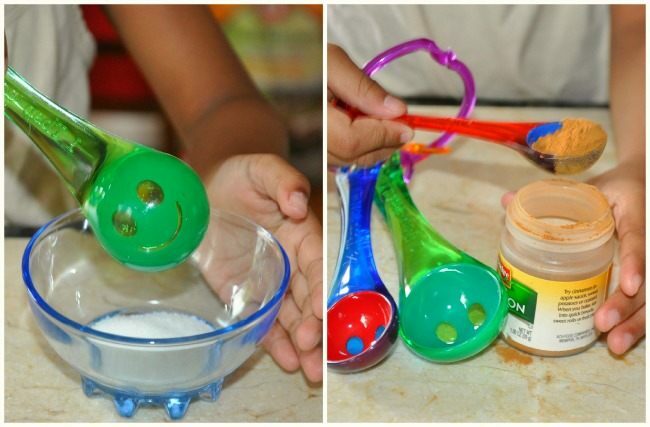 In terms of play ideas, the cups and spoons also can serve as wonderful scooping and pouring tools in a sensory bin. The nesting cups especially can be used in multiple ways during play and play based learning. Try hiding wooden letters and numbers inside the cups, counting exercises with the cups as storage boxes, ordering according to size, perfect stacking toy for the baby and many more. We were sent a few Kizmos products for this review. All opinions expressed in this post are 100% my own. Only the products we love and enjoy will make it to the blog! Following Kizmos’ Pinterest boards is an easy way to keep up with their new product releases. Follow Kizmos on Facebook to join in the conversation and to receive the latest news. If you are interested in any of the many colorful Kizmos products visit the following affiliate links. That’s not all. The amazing people at Kizmos have offered to giveaway a BUNCH of products from the Get Happy Collection. Here is a list of products ONE lucky Blog Me Mom reader will receive. Now that’s a LOT OF happy products for happy days in your kitchen making memories and messes with your children. There are only 3 mandatory options to enter the giveaway. Please leave a comment for additional entries to the giveaway. Promotion Description: The ‘Blog Me Mom: Kizmos “Get Happy” Kitchen Tools Giveaway’ (“Sweepstakes”) begins on 06/05/2013 at 07:00 AM (Pacific Time (US & Canada)) and ends on 06/19/2013 at 12:00 PM (Pacific Time (US & Canada)) (the “Promotion Period”). By participating in the Sweepstakes, each entrant unconditionally accepts and agrees to comply with and abide by these Official Rules and the decisions of Blog Me Mom which shall be final and binding in all respects. ENTRIES: Multiple entries available in Rafflecopter. A winner can only win one prize during the Giveaway. Entries using macro, robotic, script, or other forms of automatic entries will be disqualified. Entries become the property of Blog Me Mom and will not be returned. Proof of submission does not constitute proof of receipt. Blog Me Mom is not responsible for incomplete or inaccurate entries. If there is a dispute as to the identity of an online entrant, the prize will be awarded to the authorized account holder of the email address. The “authorized account holder” is defined as the natural person to whom the email address is assigned by an Internet service provider, online service provider, or other organization (e.g., business, educational institution, etc.) that is responsible for assigning email addresses for the domain associated with the submitted email address. Winner Selection: Winner(s) will be selected in a random drawing from among all eligible entries received by June 19, 2013. Drawing will be conducted by Blog Me Mom, whose decisions are final. Odds of winning will depend upon the total number of eligible entries received. Winner notification: Winner(s) will be notified via email, at Blog Me Mom’s discretion, on or about June 21, 2013. Winners’ list: Winners will be displayed on the Rafflecopter. Blog Me Mom is not responsible for the prize shipment to the winner. If defects are found in the prize the winner should contact Kizmos to rectify the issue. Automated or robotic Entries submitted by individuals or organizations will be disqualified. Internet entry must be made by the entrant. Any attempt by an entrant to obtain more than the stated number of Entries by using multiple/different email addresses, identities, registrations, logins or any other methods, including, but not limited to, commercial contest/sweepstakes subscription notification and/or entering services, will void that entrant’s Entries and that entrant may be disqualified. Final eligibility for the award of any prize is subject to eligibility verification as set forth below. All Entries must be posted by the end of the Promotion Period in order to participate. Blog Me Mom’s database clock will be the official time-keeper for this Sweepstakes. Limitation of Liability: Blog Me Mom is not responsible for any incorrect or inaccurate information, whether caused by website users or by any of the equipment or programming associated with or utilized in the Sweepstakes or by any technical or human error, which may occur in the processing of submissions in the Sweepstakes. Blog Me Mom assumes no responsibility for any misdirected or lost mail, or any error, omission, interruption, deletion, defect, delay of operation or transmission, communications line failure, theft or destruction or unauthorized access to, or alteration of, Entries. Blog Me Mom is not responsible for any problems or technical malfunction of any telephone network or lines, computer online systems, servers or providers, computer equipment, software, failure of email or players on account of technical problems or traffic congestion on the Internet or at any website or combination thereof, including injury or damage to entrant’s or any other person’s computer related to or resulting from participating downloading materials in the Sweepstakes. If, for any reason, the Sweepstakes is not capable of running as planned, including infection by computer virus bugs, tampering, unauthorized intervention, fraud, technical failures, or any other causes beyond the control of Blog Me Mom which corrupt or affect the administration, security, fairness, integrity or proper conduct of the Sweepstakes, then Blog Me Mom reserves the right in its sole discretion to cancel, terminate, modify or suspend the Sweepstakes. In such event, Blog Me Mom may, in its sole discretion, perform the random drawing from among all eligible Entries received prior to or after such cancellation, suspension, or modification. In the event of a dispute concerning who registered online to participate in the Sweepstakes, the registration will be declared to have been made by the authorized account holder is defined as the natural person who is assigned to an email address by an internet provider, online service provider, or other organization (e.g., business, education institution, etc.) that is responsible for assigning email addresses for the domain associated with the submitted email address. A potential winner may be requested to provide c with proof that the potential winner is the authorized account holder of the email address. If a dispute cannot be resolved to Blog Me Mom’s satisfaction, the entry will be deemed ineligible. Facebook Disclaimer: Entrants should understand that they are providing their information to Blog Me Mom and not to Facebook. This promotion is in no way sponsored, endorsed or administered by, or associated with Facebook. I think that they are so adorable. They are so cheerful looking and would make cooking with my daughter so much fun! I like the look of these tools. They are easily recognizable as kid friendly. My first impression is that they would be fun to use and would help get my children in the kitchen more and enjoying cooking with me. I feel like these tools would be great to have in the kitchen because they are colourful and would be easy enough for kids to use so they can help in the kitchen too. My first impression was that I LOVE them and want them for my kids! My first impression was “fun” I can see kids really enjoying these. My first impression is that they look really easy for a kid to handle. That they are adorable, and my daughter would have fun baking with me while using these. It makes the family want to come and participate in the cooking too! Your churros and donuts look AMAZING!! What a fun giveaway too. My first impression was how adorable everything is and how much my two year old would love to help mommy even more then she does now! Oh, I bet my son would just love these! He’s always helping me in the kitchen. How colorful! These are darling! I have children of my own and run a preschool…these would be great! They are so cute. I am sure my girl will to use them and help me in the kitchen.